As a unit within the Industry Liaison Office (ILO), we provide unbiased business intelligence and research analytics to the Ohio State community and external partners. The BIM can help you with your strategic planning process and the alignment of strategies – from situation analysis to final evaluation of performance. We provide intelligence in many areas – from university-industry interactions to bibliometric assessment to benchmark studies. 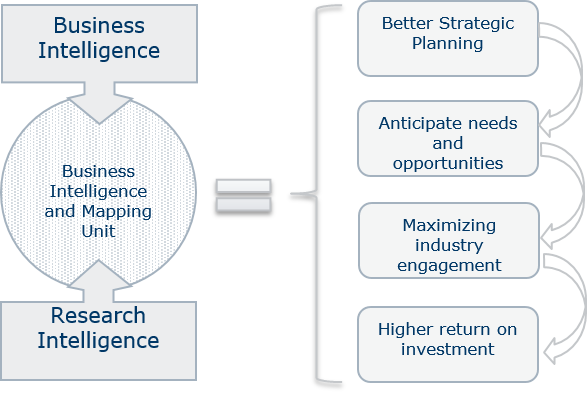 The BIM provides services in two major areas: Research Intelligence and Business Intelligence. The Business Intelligence and Mapping Unit does not endorse or recommend companies, commercial products, processes or services. BIM’s website provides links to other websites for informational purposes only and for the convenience of its users. BIM does not endorse products or services that such organizations may offer. When users select a link to an external website, they are subject to the privacy and security policies of the owners/sponsors of that external site. BIM does not guarantee the accuracy, relevance or completeness of information found on external websites.